RPCV John Perkins says that for many years he was an "economic hit man" in the world of international finance. 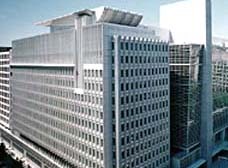 As Chief Economist and Director of Economics and Regional Planning at the consulting firm, he says his primary job was to convince Less Developed Countries (LDCs) around the world to accept multibillion dollar loans for infrastructure projects and to see to it that most of this money ended up at Main, Bechtel, Halliburton, Brown and Root, and other U.S. engineering/construction companies. The loans left the recipient countries wallowing in debt and highly vulnerable to outside political and commercial interests. 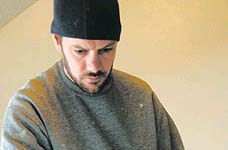 He documents his experience in the New York Times bestseller "Confessions of an Economic Hit Man." In this exclusive interview for "Peace Corps Online" conducted in March 2005, Colombia RPCV Joanne Roll, author of Remember with Honor, talks to Perkins about his Peace Corps service, his relation with the NSA, "colonization" in Ecuador, the consequences of his work, why he decided to speak out, and what his hopes are for change. JRoll: Tell us about your Peace Corps service in Ecuador? JPerkins: A Peace Corps recruiter came to campus. I was at Boston University. I was very fascinated by what he had to say. I had grown up in rural New Hampshire, over 300 years of Yankees from that part of the country in my family. I was fascinated by the indigenous people around New Hampshire, fascinated by reading books and other accounts of indigenous people around New Hampshire. I knew I had what we called then, Indian blood, in my veins. So after the recruiter finished speaking, I talked to him about going to meet such people. He said the Amazon would be a good place. After that I called a gentleman at the NSA who had been behind recruiting me, he was a family friend. He very much encouraged me to go into the Peace Corps. I actually tell that in the book, his encouraging me to do that. I was in Ecuador. I trained in Escondido CA in the summer of 1968. There were about 30 in my group. I don�t remember the training group number. I was trained as a Savings and Loan Co-op Specialist. I suppose the most frustrating part was at the beginning when I was homesick, scared, I suppose, lacking in confidence and unable to communicate with anyone in Spanish or Shwar, which is what some of the people in the Amazon spoke, the native language there. I couldn�t speak Shwar. I had an eight week Spanish training in Escondido but I certainly didn�t speak Spanish fluently. So it was a difficult experience living in the Amazon area of Ecuador, what we call the Oriente. It was to me very foreign and very difficult in the beginning. Which is interesting because I go back there a great deal, now. I love it. In the beginning, I was sick a lot of the time. I had amoebeas and parasites and I think a lot of my sickness was emotional. I was officially working with the Highland Indians but there were a lot of Shwar around and they were the people who fascinated me the most. They were after all living in their own setting and living very much in their traditional ways; where as the Highland Indians who were coming into the Amazon were very much out of their setting. JRoll How did you feel about the Colonization Program in Ecuador? JPerkins: Well, the whole idea of colonization was very disturbing to me and I didn�t think it really would work. 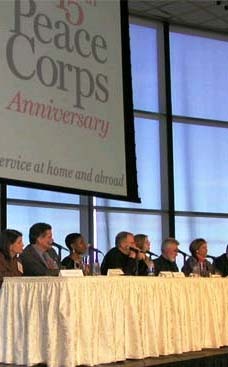 As a matter of fact, I sent a position paper to Peace Corps office in Quito and I believe one went to Washington, too. I suggested that this wasn�t going to work and that the Amazon was too fragile. I was disturbed too by the fact that the indigenous people who lived out there, the Shwar, primarily, saw that land as theirs and although Peace Corps, USAID, and the Ecuadorian government�s positions were that this was unused land, the Shwar saw this as their hunting territory. They were hunters and gathers, for the most part, and they needed very large territory. So just because someone could fly over a massive jungle and not see anyone living there, except for a few houses in a clearing, the Ecuadorian government, AID and Peace Corps all concluded that those areas were open for colonization. 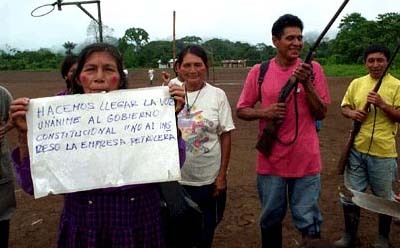 I was disturbed too by the fact that the indigenous people who lived out there, the Shwar, primarily, saw that land as theirs and although Peace Corps, USAID, and the Ecuadorian government�s positions were that this was unused land, the Shwar saw this as their hunting territory. The Shwar were saying, �No, No, they are not open for colonization. They are our territories and we need them because as hunters and gatherers, we need huge areas for hunting. Those are our territories even though we have not built houses on them. Officially, I wasn�t involved in the colonization program, I was in credit and savings. I was supposedly forming credit and savings co-ops out there in the jungle which was absurd in and of itself. But, some of the people that I worked with responded to it and we had a lot of very interesting and intense discussions around it. We were all good friends and because we were all stuck living together and we didn�t get into heated discussions because we were too close to each other. But, you know, it was quite a difference of opinion. Obviously, a lot of the people who were committed to the colonization program thought it was a good thing. I wasn�t really part of that. It did not look like a good thing. It was modeled after the old 1800s US Homestead Act. I believe the Ecuadorian government actually used a lot of the language from the Homestead Act. JRoll: So in a way, it mirrored what happened in this country. JPerkins: Well, yes. The idea of moving people out of the Highlands into the jungle and if they develop the land, they got to own it, just like the 160 acres,here. My great grandparents moved out to South Dakota when my grandfather was one year old in a very similar type of program. They were called sod busters. We were promoting the same sort of thing in the Amazon, Peace Corps, AID and the Ecuadorian government. JRoll: When you left that site, was it the consequence of your dissatisfaction with the colonization or how did that happen? JPerkins: My recollection is a bit foggy. I basically was dissatisfied with the colonization program. I also was not able to do anything with credit and saving in a place where there was no money. So, I think it was a mutual agreement on my part and with my Rep, that it was best all around for me to start working with Quecha people in the Andes. JRoll: It would appear that your second assignment was very successful. Is that how you see it? JPerkins: Yes, I think it was very successful. I helped organize a construction materials co-op with indigenous brick makers who lived outside Cuena. Prior to my arrival, they made bricks in a very crude process and sold the bricks to middle men who then transported them into the city and sold them to the consumer. The middle men made a lot of money and the brick makers were making very little money. So our idea was to develop a marketing co-op which would bring much more of the profits to the indigenous people, themselves. JRoll: I wish we had more time just to talk about your peace corps experience, but there are some other aspects of your book I would like to discuss, too. Einar Greve, MAIN contact, appears in various guises in your books, but in �Confessions of an EHM� you identify him as being a NSA liaison. Was PC/Ecuador aware of this contact? JPerkins: Well, I don�t think he ever officially identified himself as a card carrying member of the NSA. He was in the Army Reserve and I believe he told me that he did liaison with the NSA and with the intelligence community and that was part of his job. JPerkins: I don�t know, you know I�ve always liked writing and I wrote these long reports back to Emar. I really enjoyed writing them and I think, honestly, in the back of my mind, I would have to say I had a suspicion he represented the NSA and was checking me out for a future job. And, so as I wrote these reports back to him, I certainly had that knowledge in the back of my mind. It was not as though I was being paid by him or anything. All I got was whatever the Peace Corps was putting in a saving account. Sure, as I was writing these reports, I was thinking of the job I might have after I got out of the Peace Corps. JRoll: If one were to suggest that the information you provided MAIN helped them craft the financial strategies which were to prove so disastrous to indigenous people, such as the very ones you were there to help, what would you say? I became an Economic Hit Man and I implemented policies which were very diasterous to poor people around the world and very profitable to rich people. JPerkins: Well, I would say that was just the beginning of a long career for me when I did exactly those things. I became an Economic Hit Man and I implemented policies which were very diasterous to poor people around the world and very profitable to rich people. All during that process I could justify this because a) nothing I did along those lines was illegal; should be, but it isn�t. We write the international laws and at the international level it is not illegal, and b) business school support these kind of things, they say if it increases GNP, it is good for our country. All that really means is it is making the few rich people even richer and really hurting the poor. JRoll: You were there first as a Peace Corps Volunteer and then from 1971 -1981, the work which you did as an EHM was at cross purposes with what Peace Corps Volunteers were attempting to do in the LD World, then for 25 years more, you were silent about what you had helped to do. What do you say to all those volunteers who served during all that time? JPerkins: Oh well, that�s not entirely true. That sounds very nice, but every year I had to write a letter to my Draft Board in New Hampshire justifying why I should be exempt from the Draft and in the Peace Corps. In that letter, I basically had to say that as a credit and savings co-op specialist, I was fighting communism in Latin America. There was a very fine line there. The Peace Corps was, after all, a part of the United States government. We took out an ad in the Cuena newspaper saying that although we were US Peace Corps Volunteers, we opposed the war in Vietnam. We were called up to the Peace Corps office in Quito and read the riot act. A small group of us had to meet with the US Ambassador to Ecuador and again, we were read the riot act and told �never, ever, to do that. again;� that we were part of the US government and, if we did it again, we would be dismissed from the Peace Corps and probably drafted. JRoll: I really appreciate your telling us that because that is a very important part of the Peace Corps history during the 60�s and I just think it incredibly important. The more we can document those kinds of incidents, the better. But, at the same time, you then accepted and went to work deliberately and with knowledge for a company which was going to be doing things which would hurt people in the LD World. Right? JPerkins: Well, when I went to work for that company, I didn�t realize we were going to be doing things that would be hurting indigenous people. I eventually came to see that. JPerkins: She told me all those things and I understood that and felt guilty about what I was doing. I knew what I was getting into in my heart, but yet at the same time like so many people in this business, I could justify it because business schools justify it, the World Bank justified it. JRoll: But you did it and did it, in effect, for 35 years. First your work and then you were silent about what you had done. JPerkins: Well, I only did that work for ten years and all that time it bothered my conscience deeply. At the beginning, I didn�t realize the repercussions this would have on the indigenous people. As time went by, I began to see this more and more. I particularly saw in Colombia when I became friends with Paula, whose brother was fighting for the opposition and I saw how the indigenous people were being effected by our hydro projects. But, at the beginning as she (Claudine0 told these things, it seemed a little bit..I didn�t relate it to these indigenous people. You are completely right, I knew what I was getting into in my heart, but yet at the same time like so many people in this business, I could justify it because business schools justify it, the World Bank justified it. I was asked to lecture at Harvard. 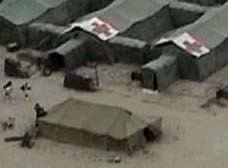 JRoll: But did you ever think of all those Volunteers, after the war was over, after there was no draft, when people made a consciencious commitment to go overseas and work with indigenous people and there you were working at cross purposes. 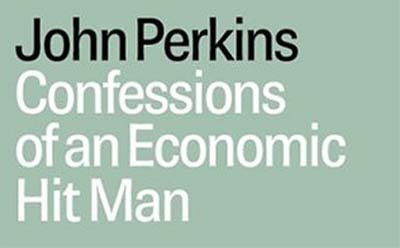 JPerkins: I don�t know if I ever thought of it in quite those concrete terms, nothing was quite so simple in those days. JRoll: Earlier, you said that the work you did was not illegal, but you thought it should have been. One of my RPCV friends asks about the UN Charter, to which the US is a party and it is a treaty which should be part of our laws. Article 55 deals with UN members� pledge to create conditions of stability and well-being, higher standards of living, full employment and conditions of economic and social progress and developments. Weren�t you in violation of the UN Charter and this article? JPerkins: I don�t know if that is the law in the United States or not. We may or may not have been. I don�t think that dictated the laws for US corporations. 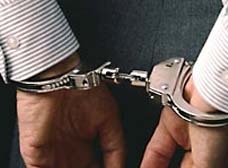 What I�m saying is US corporations, Chas T. Main and the other corporations involved in this were not breaking any laws. We were very, very careful not to. JRoll: In February 2005, activists brought a fast food company before the Strasbourg Human Rights Court. Could you see a situation where you might be brought before the International Court of Justice? JPerkins: I wish they would bring us before the International Court of Justice. Absolutely, it should happen. These things should not be permitted, but they are. JRoll: I just can�t tell you how powerful I think your statements are. In the US, in our democracy, questions of foreign policy and government accountability are absolutely part of the political debate. Yet, you were silent during the 2004 election cycle and your book was not even published until the Friday after the election. Why? JPerkins: I desperately wanted it to be published many months before the election, but every major publisher turned it down. We went to nineteen publishers before my agent found Berrett-Koehler and we wanted to publish it before the election, but physically we could not. JRoll: That really clarifies an important issue. JPerkins: I definitely wanted to speak before the election. I couldn�t get a platform. I thought I was confronting the World Bank. I was challenging them to do better and I outlined that in the speech. JRoll: After 9/11/01, you vowed to tell the truth about being an EHM, yet on May 2, 2002, you addressed the World Bank Corporate Sustainability Conference in Washington DC and said �I hope it (your talk) will inspire you � as the World Bank has both challenged and inspired me for much of my life.� And, also, �It has been 25 years since I made many of the forecasts. I have no idea how accurate they turned out to be.� Those statements appear what you wrote in EHM. Can you reconcile these statements with your Confessions? JPerkins: What do you mean? JRoll: Well, in your book, you say you knew from the very beginning, you knew those forecasts were deliberately inflated and indeed the inflated forecasts were the heart of the strategy by which these nations became indebted to the United States. JRoll: Absolutely, but you never confronted them. You never confessed to them. And when you say you didn�t have a platform, it seems to me that would have been a platform. JPerkins: You�re probably right. Let me add one other thing to that. 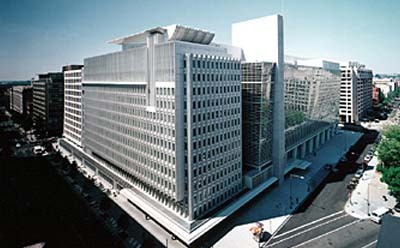 You know my credibility in those days with the World Bank, I was invited basically to speak primarily as an environmentalist and the head of a non-profit. JRoll: This was two years ago. JPerkins: Yah, but nothing was out about me except that I had written five books on indigenous people and I was a chairman of an US non-profit. JRoll: Okay, but you had worked with those people. JPerkins: Okay, I won�t say anymore. I�m just telling you that credibility comes in very strange forms. As you well know, and if we speak on subjects where no on believes we know anything if we haven�t established our credibility, who listens? JRoll: I have enjoyed reading so much of your work. 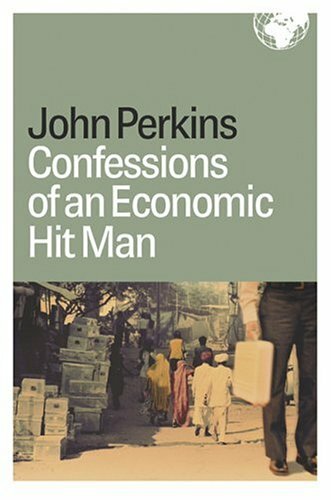 Observing your various works collectively, one might conclude that Confessions of an Economic Hit Man is not so much a completely factual account of your consulting career, but rather a synthesis which you came to after experiences similar to the journey described in your book, Psychonavigation. Would it be accurate to say that Confessions of an Economic Hit Man is an expression of your work in which all the aspects of your life came suddenly together and you came to understand your role in creating the current crisis, and then, had a catharsis leading to your proposal of a cultural transformation? What I want to leave the reader with is a tremendous hope that we can change and that we are at a point in history for that to happen. All the indigenous people teach us, since they all have prophecies, they all prophesize that this is the period of opportunity for transformation and I believe it is. JPerkins: It�s factual. It is the story of my life. It is obviously condensed. You can�t write about a 60 year long life in a 200 odd page book. I didn�t write about the 1000s of hours I spent running report because I don�t think people are interested in hearing about all those details. I tried to write about things I thought would interest people. But, everything in the book, I actually experienced. One of your statements there is accurate. The intent of the book and what I want to leave the reader with is a tremendous hope that we can change and that we are at a point in history for that to happen. All the indigenous people teach us, since they all have prophecies, they all prophesize that this is the period of opportunity for transformation and I believe it is. We simply can not go on the way that we have been going. The experiment of this empire is a failure, in essence. Five percent of the world�s people live in the United States and we consume over 25% of the world�s resources and create more than 25% of the world�s serious pollution. That is not a model which can be replicated and it not even a model we can continue doing and so we know that over the next 30 years or so, things are going to have to change radically. The opportunity is now. 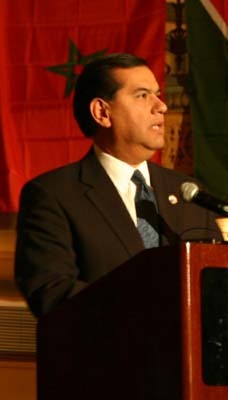 We have the resources in the United States and within ourselves, our creativity, our power to communicate. We have the power to create something new and very different., truly a new paradigm, one that reflects our forefathers� ideals of life, liberty and the pursuit of happiness for all people. JRoll: In your book, you speak of how the words of Thomas Paine were transforming, but what happened in America was not just a cultural transformation but it was a war, a violent revolution. Do you see that coming out of your words? JPerkins: I don�t really see what�s going to come out of the statements. That�s not my job. My job was to write about what I experienced, what I�ve seen and to inspire people to move in the direction in which they need to move. That�s how I see my job. I don�t know what will come of this, quite frankly, but I hope what will come from it is more people speaking out, more economic hit men coming out of the shadows and speaking about what they�ve done and more people realizing we all really have to follow our hearts. The things you�ve accused me of, Joanne, are real. I denied a lot of stuff. I did things I knew in my heart were wrong, even though legal, and accepted by our best Business schools. I would suggest that probably everybody, every Returned Peace Corps Volunteer is doing things like that. We are driving cars we know are too large, we�re driving them too often, we�re driving them with only one person in these huge monster cars to get us from one place to another. We�re consuming more than we need to consume. We�re building bigger houses than we need to build. We�re all guilty of these things. JRoll: Your book impressed me in that all of us who lived in the Third World have to come home and try to integrate that experience, trying to put it all together and to live with the guilt, knowing we are survivors, knowing that we are incredibly lucky and that we then try to live in both worlds. 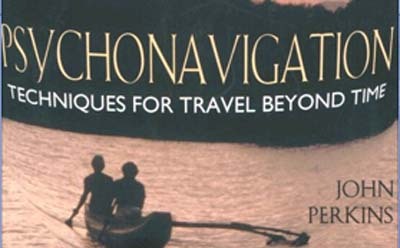 What your book attempts to, I think, is to integrate your experiences in a way which leads to a more equitable world. I salute you for that. It�s just a long time coming. JPerkins: Maybe so. When yours� coming? JRoll: I �m not sure�although you don�t know me. I think that one of the things we have to do as Returned Volunteers is to be scrupulously honest about where we were and what we did and to be as honest as soon as we come home. 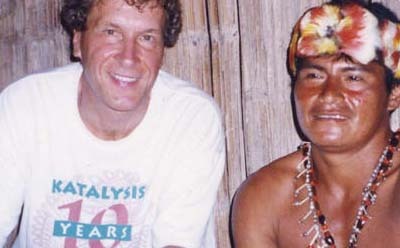 I helped to form the Fundacion Pachamama on whose board I serve. 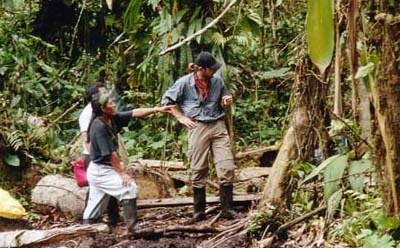 We send down roughly a million dollars a year to help the Amazonian people of Ecuador and Peru to help them fight oil companies and for other things. JPerkins: I really agree with you if we can define what we mean by honesty. 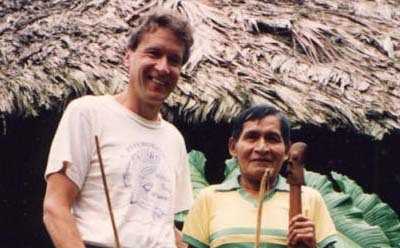 In 1990, I formed a non-profit organization, Dream Change (www.DreamDChange.org) and we have done a lot of work to try and help Amazonian people. Also I helped to form the Fundacion Pachamama on whose board I serve. We send down roughly a million dollars a year to help the Amazonian people of Ecuador and Peru to help them fight oil companies and for other things. JRoll: To paraphrase Pauline Kael, a New York theatre critic who characterized Arthur Miller, in his play �After the Fall� about his marriage with Marilyn Monroe, �He entered the confessional the sinner and emerged the priest.� It seems to me that is what you�ve done in this book. JPerkins: And, well, the point is? JRoll: I wish you had done it sooner and the fact that you didn�t does speak to credibility. I also am concerned when you really suggest that we, the United States, while what you did was not illegal in your context, certainly the idea of CIA assassinations and the military aggressiveness. That�s powerful and means this county is culpable and in a way which would justify the 9/11 attacks and that is where your credibility comes into question. JPerkins: Nothing justifies the 9/11 attack. I don�t justify the 9/11 attacks. I certainly don�t think I say that in the book. The 9/11 attack raises an issue which we need to look at very seriously, but that certainly doesn�t justify the attacks. As to writing the book earlier, well you can believe that if you want, but I doubt I could have gotten it published earlier. I had a hard enough time getting it published. I had written five other books and still couldn�t get it published. I think one of the reasons this book is so popular, right now, on all the best seller lists is because of the timing. I don�t know if it would have been nearly as popular back before 9/11 or during the Clinton administration. I�m not sure it would have been so popular if Gore had won or if Kerry had won. I don�t know the answer. I do believe that things happen for a reason. I have tremendous faith. That�s one of the things the indigenous people have taught me; that things happen at the right time for the right reason. I ran a non-profit that worked tremendously with these people during the 90�s and I learned a great deal from these people without that tremendous background, I don�t think I could have written the book or would have written the book. So to say I should have published it earlier is very academic and you know it is a cute thing for you to say. The fact of the matter is I don�t think I could have written it any sooner. I don�t think I was capable of writing it any sooner and I doubt if it would have had the same message any sooner. JRoll: In the 70�s, during the time you were working with the corporactocry, that is when damage was being done. If I had written the book in the 70�s, I wouldn�t have experienced the things I experienced. I didn�t have anything to write about in the 70�s. JPerkins: Then there wouldn�t have been any more of the book. Yes, I could have written about Claudine and that would have been the book. Who would have published that? I mean, you�re being very naïve, Joanne, in order to write the book I had to go through all the stuff I went through, including all the stuff with Stone-Webster up til 1997, including the stuff I went through with Dream Change. Anyway, this is rather a mute point. I have written the book and no one else has. No other Economic Hit Men have come forward and hopefully they will now. Some are already contacting me and I am hoping that more of them will write their stories. JRoll: I want to thank you. I appreciate very much that you took this time with us. You�ve answered my questions very honestly. I think these are the kinds of things that those of us who were in the Peace Corps have to deal with every day; our memories and our work. This book is central to that effort. Again, I appreciate your honesty and your confronting me. What an inane interview. I just read it quickly and I'm not going to read it again. Maybe the interviewer could have explored the book more closely, asked probing questions about the author's path in understanding international "aid" as detrimental, harmful to third world countries, etc. Instead, she seems to harp on the author's being "silent" when he could have been protesting the World Bank. The author, to his credit, counters that there wouldn't have been a story there if his career hadn't followed the path it did-- it took years to have the experiences he writes about. And as far as being silent goes, this isn't a conspiracy. There aren't smoke-filled rooms shoving money out the door into plutocrats' Swiss bank accounts. Plenty of well-meaning people believe, or have believed, that these big financial transfers actually help. The failure of foreign aid only seems obvious as the cumulative results pile in.